COLOGNE - China has intensified it's grip, control and access to Zimbabwe's mineral wealth by reportedly demanding diamonds and oil drilling rights from President Emmerson Mnangagwa's government, as payment for printing and backing a new Zimbabwe currency, and the building of an opulent new capital city in Mount Hampden, Spotlight Zimbabwe has reported. The new Zimbabwe dollar is expected to be launched in early 2020, to repeal and replace the surrogate currency of bond notes, and will be backed by the country's diamond and gold reserves supported by Beijing, which holds the largest diamond reserves in Asia, diplomatic sources in Harare said this week. 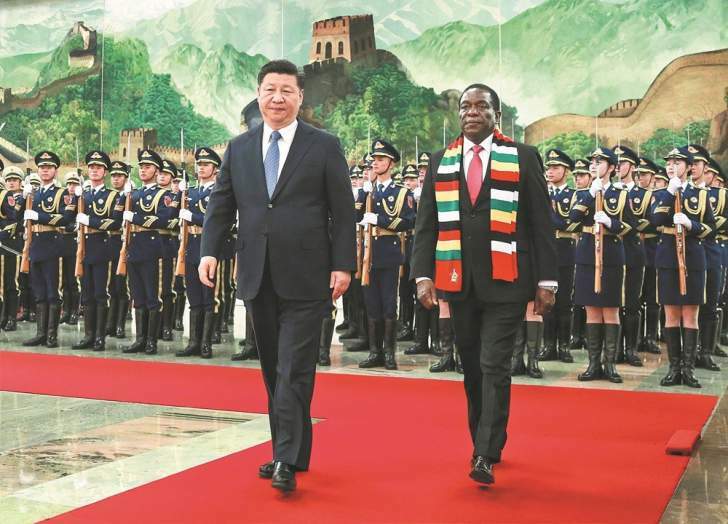 Mt Hampden city, the new capital city, itself a Mnangagwa brainchild mooted when he was still vice president in 2015, is expected to be operational when a new Chinese funded parliament in the city is completed around 2021. Mount Hampden is situated some 20km from central Harare, and is also nearby to the landmark Charles Prince Airport in Mashonaland East Province. Prominent features of the new capital, which is part of a grand strategy to de-congest Harare, and designed in the mould of South Africa's economic capital Johannesburg, include a university, technology centre, schools, churches, hospitals, industrial sites, residential areas, shopping malls, and hotels. The city will house the new parliament complex at a value of more than US$140 million, together with a new State House for the head of state, including the official residences for the Speaker of parliament and the Senate president. Zimbabwe trashed its fiat currency in 2009 after it was ravaged by hyper-inflation which had peaked at around 500 billion percent, rendering it unusable. It then adopted a slew of foreign currencies, including the US dollar, the South African rand, the British pound and the Euro. "It is all about oil and diamonds," said one envoy representing a South Asian country. "China has demanded for oil rights and exclusive access to your country's diamonds in Marange, without having to cede ownership of those assests to locals under the indigenisation threshold. It will soon not be applying to their firms coming back to mine diamonds, following a fallout with Robert Mugabe's government. Actually it could be the reason why Mugabe is no longer in power, because he wanted Chinese companies to be under Zimbabwean miners thus posing a threat to Beijing's diamond interests and long term future reserves. Marange had become their biggest foreign source of diamonds to supplement, about 50% of their proven diamond reserves concentrated in the Liaoning Province. That is why they're generously constructing the new city, and working on the new Zimbabwe dollar set to be launched in early 2020. It is being printed as we speak, but the date of introduction remains a secret." In July 2017, Mnangagwa, then VP, was quoted by a state newspaper saying that government was "building diamond and gold reserves to back the local currency upon its re-introduction in future". "We are building reserves of gold and diamonds which if they reach a certain level I will not tell you here, it will then allow us to introduce our own currency that will be backed by those minerals. I am not at liberty to disclose to you the level that we want those minerals to reach before they can back our own currency," Mnangagwa was quoted as saying. Another diplomat said China had signed a deal on access to Zimbabwe's oil and gas exploration in 2009, but it had not yet been formalised. "The departure of President Mugabe affected many deals with China, as they had to be revisted when Mnangagwa came in," said the diplomat from her mission residence by phone last night. "They're in desperate need to secure oil for future energy security, and the 2009 deal now formalised, gives them oil and gas exploration rights covering millions of acres of land on the Zambezi Valley, amid strong belief that this country holds huge oil and natural gas deposits according to feasibility studies conducted by a five-member team of Chinese oil experts that has been resident in Zimbabwe since 2008." "Major players in the deal includes senior military and intelligence officers, Mnangagwa's Zanu PF party, China Sonangol International Limited , China National Petroleum Corporation and the China Development Bank. Not everything makes it into the newspapers, but Zimbabwe will soon have a new currency and capital city because this deal has been sealed, and your president is coming up with a favorable new diamond policy to appease China, which should be signed into law soon." According to the U.S Energy Information Administration (EIA), China is going to be having about 120 million private cars by 2020, and is projected to import at least 60 percent of her oil requirements. Oil exploration and production has now become one of the key areas of Beijing's foreign investments in Zimbabwe and Africa. The Asian economic powerhouse has also increased her diplomatic and economic engagement in Southern Africa, especially with South Africa and Angola. Despite not importing oil products from South Africa, China has set out to benefit and acquire South Africa's technology in the energy sector, particularly the advanced refining and gasification infrastructure of Sasol, a South African based International firm. The Chinese Embassy could not provide comment, as acting Chinese Ambassador to Zimbabwe, Zhao Baogang, was said to be out of office for the day yesterday late afternoon. China is now Zimbabwe's second largest trading partner after South Africa and leading arms supplier, benefiting immensely from Harare's blind mortgaging of natural resources in exchange for arms and other military technology. The government has already granted China mineral concessions for gold, platinum, lithium, aluminum and zinc to mention but a few.